Historians, collectors of military history or lovers of music, including jukebox or rock'n'roll history, will all be interested in Wurlitzer Music gifts. Wurlitzer, which received its original success because of contracts with the military to provide musical instruments to the military, eventually branched out into other technology. Image Time promises all its products are of the highest quality with the best reputation for reliability in the time keeping accuracy and quality of neon clocks. Image Time clocks keep on ticking for 100,000 hours or more. Investment in these clocks provides accurate time keeping to their owners over the course of decades. Historians, music lovers and collectors of items such as music paraphernalia and jukeboxes or steno graphs will adore having this clock decorated with its vintage artwork in their collection! 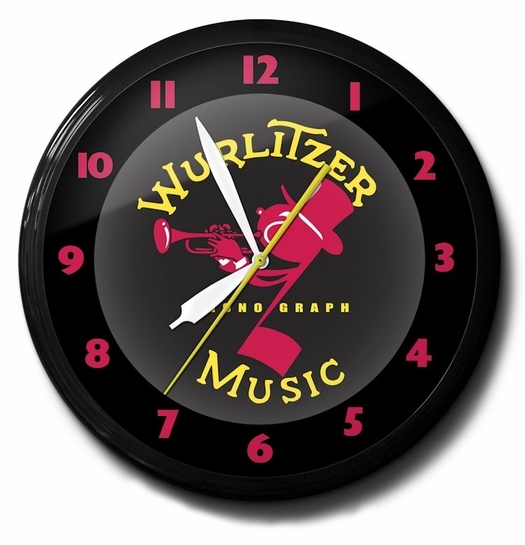 Subject: Neon Clock for Wurlitzer Music fans and enthusiasts. Ask a question about Wurlitzer Music Neon Clock, High Quality, 20 Inch.